(20 April 1989, Calcutta) – The ancient name for South Bengal is “Samatat”. The land is close to the sea. In colloquial Bengali, Samatat is called Bágri. On the east of Samatat is Banga Dabak, on the west is East Ráŕh, on the north is Barendrabhum and on the south is the Bay of Bengal. That is, South Bengal comprises the eastern portion of Murshidabad, and Kusthia, Nadia, 24 Parganas, Calcutta, Jessore, Khulna, Barishal, Faridpur and Patuakhali districts. On the west of South Bengal flows the Bhagirathi River, on the north the Ganges and Padma Rivers, and on the east the Padma and Jamuna Rivers. These rivers form a triangle. The land of Samatat has been built by the alluvial soil and silt of the Ganges, Bhagirathi and Padma, and is much more recent than the soil of Ráŕh. The soil of Ráŕh is 300 million years old, whereas the soil of Samatat is only 10,000 to 15,000 years old. No relic or evidence of anything older than 8,000 years can be discovered in Samatat. The area known as the Sundarbans is still more recent. The soil of Samatat is very moist and fertile. The climate of Samatat is humid, so the inhabitants cannot labour hard. For much of the year there is rainfall. The people have had to survive against extreme heat and heavy rain, so they have developed fighting spirit. As the land of Samatat was built with silt and alluvial soil, and with some portions which rose up from the sea bed, no mineral resources can be found. In olden times, Samatat was very famous for pearls and sea products. The merchants of Bengal used to trade in pearls which were in great demand in places such as China, Rome, Egypt and Mesopotamia. The civilization of Samatat started about 8,000 years ago. About 700 years ago, during the early part of the Pathan rule, there was a devastating cyclone which submerged Samatat. The sea water rose about twenty feet and destroyed everything for 200 miles inland. Whatever existed within this radius – towns, cities, villages, trees, plants, animals, human beings – was totally destroyed. When the water receded, there were no living beings in the area. After some time new grass, shrubs, plants and trees began to grow. The people of Ráŕh went to Samatat with their implements, established settlements, and began farming the vast tracts of uninhabited land. New plants and trees created thick foliage and vast forests – the present Sundarbans. The people of Ráŕh cleared parts of this forest area and built villages. The geographical features and environment of Samatat changed radically following this catastrophic cyclone, and the soil, particularly in the southern portion of 24 Parganas, became saline. The air, water and environment of Samatat also became saline. Crops do not grow well in saline soil; in fact, saline soil is almost unfit for agriculture. Mud and brick houses decay quickly due to the corrosive effect of the salinity. The saline water is useless for irrigation. The farmers of South Bengal only harvest one poor crop a year, and that with great difficulty. Due to the saline weather, the people of Samatat suffer from stomach trouble throughout the year. There are no good prospects for agriculture, trade or commerce. Once there were some medium-scale cottage industries, but these are gradually disappearing. Over and above this miserable economic condition, there is severe psycho-economic exploitation. At one time the people of Samatat enjoyed fifty percent of Bengal’s fortune and glory. The ancient Roman historians described Bengal as Ganga-Ridi [the land between the Ganges River and Ráŕh]. Samatat made a major contribution to Bengal’s legacy, because it embodied the fighting spirit of the Bengalees. In every age the people of Samatat used to bear the brunt of foreign invasion. Foreign invaders used to enter Bengal along the South Bengal coast. The glory, natural beauty and economic prosperity of Samatat used to attract foreign visitors, but now the same region is in an extremely precarious condition because of its saline environment and the severe economic exploitation. Today South Bengal must be built anew. About 4,000 years ago there was a valiant king in Samatat called Sagar, who had an equally valiant navy. He was the supreme commander of the navy, which patrolled the Bay of Bengal. His son, Bhagirathi, was a civil engineer who excavated a canal from Malda south to the Bay of Bengal to facilitate improved agriculture in East Ráŕh and the southern portion of Bengal. This canal has now taken the form of the river Bhagirathi. In old Bengali rhymes the Bhagirathi was called “Bhaga’s Canal”. The Bay of Bengal was called “Ságara”. The greatest curse of Samatat is its salinity, which is why this region is called “Saline Bengal”. Suitable steps have to be taken to save South Bengal from the detrimental influence of salinity. First, the soil has to be made free from salinity, and for that sweet water has to be brought from the rivers of Ráŕh, such as the Suvarnareka, Kangsavati, Damodar, Ajaya, Mayuraksi and Rupnarayana. The sweet water should be channelled through huge underground pipes so that the ponds, tanks, canals, rivers and rivulets will again be supplied with sweet water. At present, the rivers of Samatat are extremely saline. All the rivers should be filled with sweet water except those parts near the confluence of the Bay of Bengal. Once the soil gets back its natural composition and is free from salinity, it will be easy to produce four paddy crops in a year and various other cash crops. Moreover, when the soil and water are desalinated, the degree of salinity in the air will also decline considerably. This will provide a congenial environment for improved agriculture, trade and commerce, and industrial development. The amount of power needed to supply the industrial centres can be derived from the ebb and flow of the tides in the Bay of Bengal. Small-scale cottage industries can be started in every home in South Bengal so that even the women of the farming families can take part in industry. This approach will go a long way toward solving the widespread unemployment problem. South Bengal must be self-sufficient in power production, and windmills can also be used as a supplementary source of power generation. 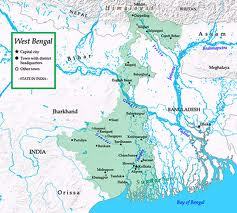 The very survival of South Bengal depends upon its freedom from salinity. Most of the rivers and canals are now silted and reduced to stagnant reservoirs. They have to be reclaimed, and a proper drainage system must be built. At one time South Bengal was famous for its shipbuilding industry and there were a number of shipbuilding yards. Even 150 years ago large ships were built from these centres. Another profitable industry in South Bengal was the salt industry. Salt production in the past used to meet the demands of all India, and the surplus was exported. The British systematically destroyed the salt industry, and as a result about 500,000 people were deprived of their traditional means of livelihood. To reorganize the economy of South Bengal, the salt industry should be rebuilt. Since olden days Samatat has experienced a series of political misfortunes, but the people of this region must once again rise up and overcome all obstacles. In the coastal areas of South Bengal there are various types of seaweed which are useful for the pharmaceutical industry. Through the development of agro-industries and agrico-industries, the local population can solve their unemployment problems, while cottage industries, small-scale industries and cooperative enterprises can provide income to the poor. Once the soil, water and air are made free from the pernicious effects of salinity, the people will get back their vitality. They will enjoy a new lease of life and experience better health, greater longevity and a higher standard of living.